Have you ever wanted to be a movie star? In a zombie movie? 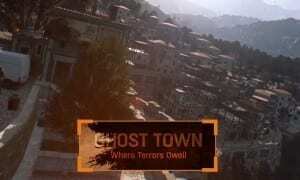 Well now you can — if you have a spare $10,000,000USD laying around… Techland, developers of the Dying Light video game, are teaming together with GAME UK to give one individual a once-in-a-lifetime opportunity to land a role in a movie without having to suffer through casting calls and auditions. A single Spotlight Edition of Dying Light: The Following – Enhanced Edition is available for the low, low price of $10,000,000USD (yes that’s million) and includes a supporting role in Dying Light: The Movie. 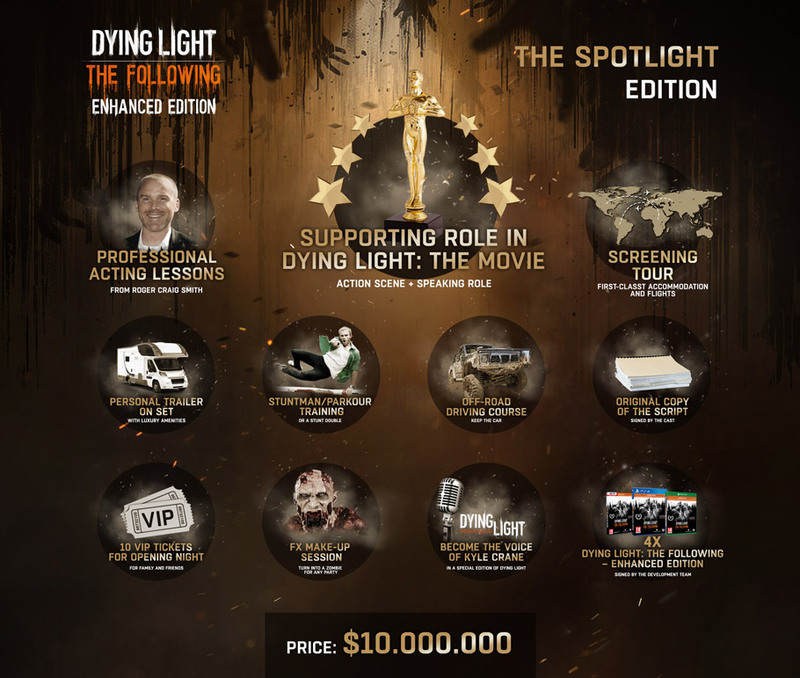 Not only that, it also includes a number of other bonuses including professional acting lessons, stuntman/parkour training, off-road driving course training, an original copy of the script, make-up sessions, 4 copies of Dying Light: The Following – Enhanced Edition, and much more. Supporting Role in Dying Light: The Movie — Become an integral part of Dying Light’s move to the silver screen! Participate in action scenes and deliver lines with an international cast of actors. Screening Tour — VIP passes, first-class flights and five-star accommodation for every film festival and special screening featuring Dying Light: The Movie. Professional Acting Lessons with Roger Craig Smith — The voice of Dying Light’s Kyle Crane and one of the most talented and prolific video game voice actor will make sure your delivery creates a powerful and lasting impression. Personal Trailer on Set — Enjoy the luxury you deserve. Custom-made, personal trailer to make your time on set as comfortable as humanly possible. Luxury amenities, 3-star chef catering and 24/7 service included. 10 VIP Tickets for Opening Night — Share your moment of success with family and friends. Original Copy of the Script — A lasting memento, signed by the cast. Stuntman/Parkour Training — Show everyone your best during action sequences thanks to a professional and extensive course OR leave the taste of danger to a personal stunt double. 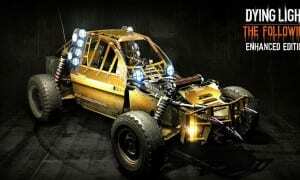 Off-road Driving Course — Join the high-octane action of Dying Light: The Movie driving sequences. And you get to keep your favorite car from training! 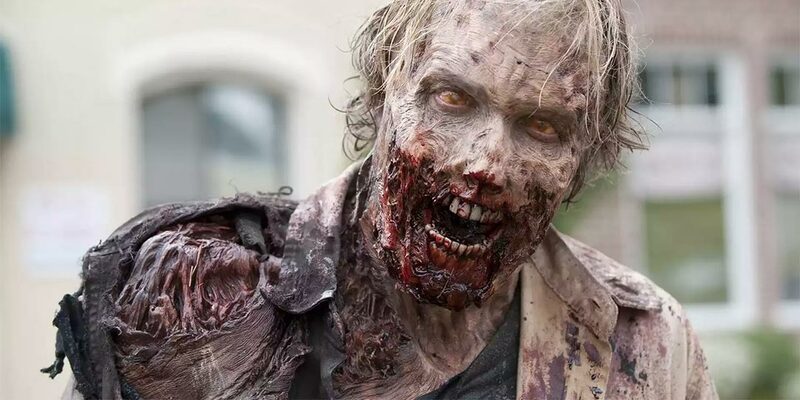 FX Make-up Session — Become the sensation of any party by turning into a gruesome zombie thanks to the help of a professional make-up artist. Become the Voice of Kyle Crane — Relive the outbreak in Harran in a much more personal manner! 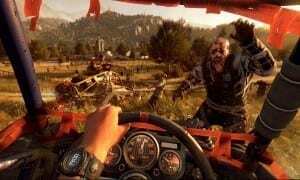 Kyle Crane will now speak with your voice in a personalized version of Dying Light which you can share with your friends! 4 Copies of Dying Light: The Following – Enhanced Edition — Signed by the dev team, for the platform system of your choice. What do you think about the $10,000,000USD price tag for a guaranteed spot in a movie and all the extras that come with it? Let us know in the comments below, or on Google+, Twitter, or Facebook.